The Communications and Marketing Commission (CMC) is open to all AFC members and is geared specifically to those in public relations, marketing, graphic and/or web design, development, and communications positions. Responsible for the LeRoy Collins Distinguished Alumni Awards. This event is held every two years and celebrates the achievements of our alumni in the categories of Against All Odds, Hometown Hero, Rising Star, and Lifetime Achievement. The commission's annual fundraising event is the Awards of Excellence. The competition involves all 28 Florida colleges in the categories of print design, web design, marketing, public relations story pitches, commercials, photography, and more. We provide leadership opportunities by becoming a member of the board in the positions of Chair, Chair-Elect, Vice Chair, and Communications Officer. Greetings Communications and Marketing Commission! I am excited to welcome you to a new year of professional development and recognition opportunities with the Association of Florida Colleges – Communications and Marketing Commission! I am ecstatic to work with all of you as Commission Chair! Our first order of business is to fill some vacancies on the CMC executive board. I’ve included a roster of our current board members as well positions that are currently vacant. I highly encourage everyone to consider taking a leadership role in the commission this year, I speak from experience when I say that the connections and opportunity that come from the experience is invaluable! Please feel to reach out to me if interested. 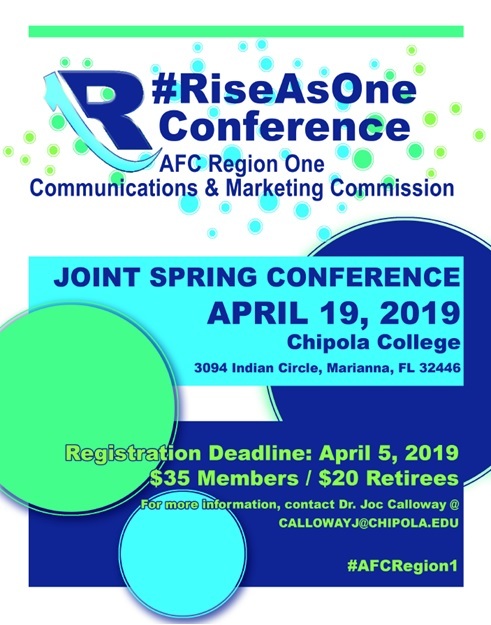 SAVE–THE–DATE: I am excited to announce that the CMC Spring Conference 2019 will be held April 19, 2019 at Chipola College in beautiful Marianna, Florida! We have formed an exciting partnership with Region I of AFC and I look forward to sharing more details as they become available. In addition to our annual Spring Conference to look forward to, we also have the annual Awards of Excellence as well as the Prestigious Leroy Collins Distinguished Alumni Awards! More information about both will be shared soon. I look forward to this upcoming year and hope to see you all involved! 2019 CMC AWARDS OF EXCELLENCE: CALL FOR ENTRIES: Call for Entries coming soon! 2019 LEROY COLLINS DISTINGUISHED ALUMNI AWARDS: Nomination Information coming soon! The CMC is looking for volunteers to help with a re-publishing project of Dr. Walter Smith's book "The Magnificent Twelve: Florida's Black Junior Colleges." Published in 1994, the book has long been out of print and volunteers are needed to re-type chapters, edit, proof, create layouts, gather photos, explore printing options, marketing materials, promotional videos, etc. All proceeds generated by new sales of Dr. Smith’s book (both in print and digital) will be split between the Dr. Walter Smith Library in Tampa and the AFC Foundation. SOCIAL MEDIA - GET CONNECTED! AFC Connections is our private interactive forum. Within this forum, we have the Communications and Marketing Commission Community. Please join the community and connect with us today! Scroll down to the communications and marketing commission community and select it.